The Cane Holder easily attaches to most canes. Hang canes on tables, chairs, countertops and more! Great in your kitchen, at restaurants and when traveling. 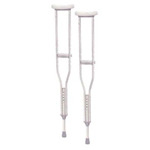 The Cane Strap by Nova Medical Products fits all canes. The Cane Flashlight FL-1000 by Nova Medical Products adds extra light for safety in dark places and attaches directly to most canes, walkers, transport chairs and wheelchairs. Lightweight design and low center of gravity combine for greater stability and balance. The offset handle rotates for use with either the left or right hand. Available in different styles and colors. Good to have just in case.Grey, 1 pr/Blister card.